Did your new house come with a woodstove? It's a little late now that the cold is upon us but every stove or fireplace should be thoroughly inspected and cleaned in the off season to ensure safe operation all winter. Nevertheless you need the heat so here's a list of things you can check today. Using a strong flashlight, look inside the stove and if able, up the chimney (AKA stove pipe). Look for blockages or heavy buildup of ashes, soot and or creosote. Use your best judgement - if you wouldn't be able to breathe through it, your fire probably won't either. Clean out what you can with a brush or whisk broom and dusk pan. Assuming the ash is cool sprinkle on your gardens as a fertilizer. Check the firebrick and hearth stones for cracks or missing pieces. 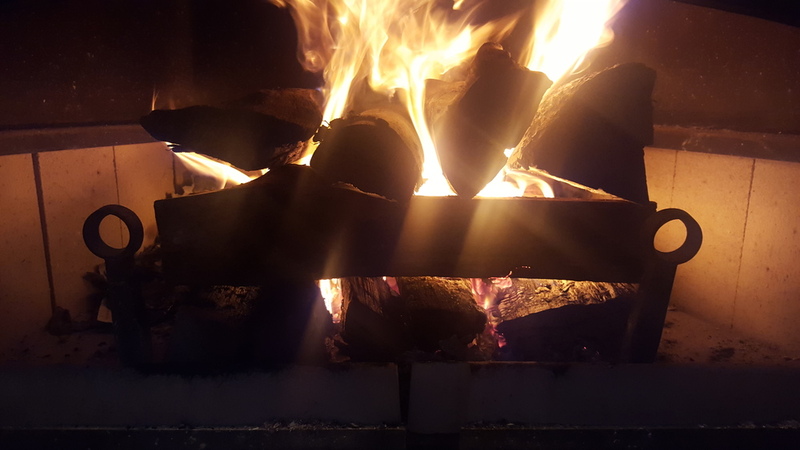 The firebrick is a heat resistant stone that insulates the metal shell of the stove from unwanted stress due to heat. Eventually the firebrick will break down and need to be replaced. Cracks can occur from throwing heavy pieces of firewood against them. Make sure the door seals properly. The "dollar bill test" works well. Take a dollar bill or similar piece of paper. Dollar bills are less likely to rip than paper. Place the bill in the door and close it. Now pull the bill out from the door. If it slides freely your door isn't sealing properly. If it doesn't slide open the door, move to another spot, shut door and try again. A good seal won't allow the dollar bill to slide out when you pull. If your door seals properly your stove will work as it should and you will be able to control the burn rate with the air control valve and damper. If your door isn't sealing, don't use your stove until you replace your gaskets or adjust your door. Check around the stove to be sure there is at least a foot of space around the entire unit and no flammable materials or surfaces nearby. Stoves should be set upon a brick or stone floor with a similarly built wall to deflect heat and stray sparks. Once you're comfortable with your stove, open the door up, you're ready to burn! Everyone has their own style of fire starting. You'll develop your own style if you haven't already. Much of it depends on how much time you have and what you have available for kindling wood. I split, dry and store my own wood which I cut from a small piece of woods in my backyard. Among the hardwood trees that I select for firewood I cut a few softwood trees like pine for kindling. I'll follow this post with a detail about that process as I'll be finishing up next years kindling pile this afternoon. I lay one piece of pine kindling in the stove towards the front parallel with the door opening. On top of that goes two pieces of kindling at either end laying perpendicular to make a U shape. Within the U I crumple a few pieces of newspaper or junk mail. On top of the paper pile goes more kindling perpendicular to the lower two pieces. As you can see we're building a small "cob" of kindling. I have my process whittled down to six pieces of pine about the diameter of a cucumber. There are many options for kindling; sticks, fire starter bricks, twisted up paper, cardboard or even a mix of all of the above. The key is dry! No matter what your kindling is, it needs to be dry. If this is your first year you can bet you'll have a better handle on kindling next year. I used scrap wood and wood flooring scrap as kindling my first season with the stoves. Be sure the damper is open and the air control is set fully open. Light the paper and allow time for the kindling to catch. There are a lot of contributors to how well or poor your chimney drafts. If you start the fire and smoke isn't immediately invited up the chimney your draft is likely poor and needs a little help. Open a window nearby to allow fresh air into the room that the fire will use to burn and feed the smoke up and out the chimney. If weather conditions or poor ventilation in your home make for poor draft, use this trick before starting your kindle fire. Once your kindle fire is arranged and ready to be lit. Light a piece of paper in your hand and hold it above your fire and close to the chimney (with the damper open of course). The smoke from the burning paper should draw up the chimney indicating that you have a draft. If it doesn't, open a window or door and try again. Once you have a draft, Light It! Once your kindle fire is burning on it's own, close the door down leaving a gap to allow air in. The fire will flicker and dance as it works to pull fresh air through the gap in the door. This is accelerating the burn getting us closer to a bed of embers when we can add fuel (firewood). Once you have a bed of embers from your kindle fire you're ready to add wood. Pictured above is a mornings worth of fuel piled on a bed of embers. I start with smaller wood and each time I fill the stove add larger pieces. If you have time, encourage the fire before shutting the doors. Using a bellows I may accelerate the fire once I add wood. Keep in mind that once you shut the door you'll be limiting the airflow to the fire. Shutting the door too early will make a smoky fire. Now that the fire is burning evenly on it's own momentum it's time to seal it up. Close the door, don't latch it so tight that you'll need force to open it. Just seal it. Close the damper - if your stove have a two position damper (like mine) you have open or closed with no in between. If your stove have a damper on the pipe, don't close it all the way until you're sure you have a hot clean burning fire. Closing the damper helps keep the heat in the stove while allowing the smoke to draft out the chimney. Closing too tightly too early will smother the fire and possibly back drat your stove, filling the room with smoke. Regulate the burn rate with the air control. I elect to burn slowly, using the stove as a supplement to the conventional HVAC system in my home. Spend a week or so trying different burn rates to see what your home and stove require to heat efficiently. Allowing less air in the stove burns the wood slower making less heat. More air in the stove burn wood faster making more heat. Remember that more heat uses more fuel requiring more attention and higher costs. Commit. Just like your cooking oven, the more you open the door the longer it takes to heat. Fill the stove completely and leave the door closed until it needs to be filled. I know that on an average winter day if I load the stove before breakfast it will need to be filled at lunch. The above picture still has plenty of heat left and could keep the house warm for another hour or so, but I elected to fill it. With a poker, lay out your bed of embers to accept the next load of wood. Being the afternoon fire I'll be loading with larger wood. The coals have plenty of energy to ignite the larger wood quickly. Smaller wood may be burned up quicker than I want. Fill your entire stove. I like the cob or crisscross pile because I find the pile stays together longer and you can get more in the stove. I have three large pieces of maple on the bottom and various sizes of ash and maples on the top. This wood was cut three years ago, dried in a pile for a year and has been piled in the basement for a season - its dry! If you haven't gotten home to see a hot bed of coals to begin your next load you might be able revive the fire with whats there anyway. Heat rises and the nature of a wood stove is to heat like a radiator sending heat out to it's immediate surrounding. You may struggle getting the heat to those rooms on the other side of the house without something to encourage air movement. Wood stoves and fireplace pull moisture with their draft. You'll notice your house getting drier and drier, eventually you'll see cracks in the paint and maybe even have joints separate. Some people complain of having their sinuses dry out. Monitor your homes moisture levels with a humidistat and implement a humidifier. 30 to 50% humidity is optimal. All wood was once green and held moisture like sap and water. Wood can be dried in a number of ways, some more costly than other. For example kiln dried wood that is dried mechanically and quickly is sold at a premium due to the associated costs. Seasoned wood is cheaper in that mother nature removes the moisture over time. Semi seasoned or "green" wood is cheapest but months from being usable fuel. Only store dry wood indoors unless accompanied by a dehumidifier to remove moisture from the air. Firewood will have some moisture or it would be dust. Moisture takes energy from the fire to evaporate the steam. Moist wood burns slow. A piece of wet wood won't ruin your day, in fact in a hot fire it may help slow things down. A pile of wet wood is better burned next year. And as always feel free to take the information I've shared and create your own success. There's a lot of good information out there but nothing beats first hand experience.